Minimum Quantity Lubrication is becoming increasingly popular in machining processes, as it is sustainable and environmentally friendly while improving productivity and cutting costs. SKF has employed Minimum Quantity Lubrication (MQL) for its own manufacturing processes and has also developed a comprehensive portfolio of MQL solutions through its LubriLean range. 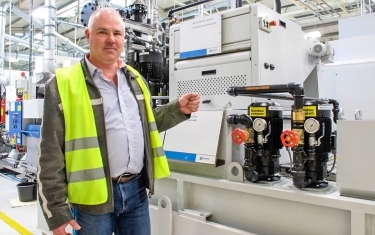 While SKF has recorded significant benefits from its introduction of MQL, including dramatic reductions in oil consumption and higher productivity of machining, one of its specialized lubrication distributors, HRE Hydraulic S.L. 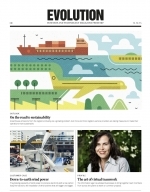 in Spain, commissioned research to quantify the overall savings in total cost of ownership. Tecnalia, a leading research and development company based near Bilbao in Spain, carried out the tests. 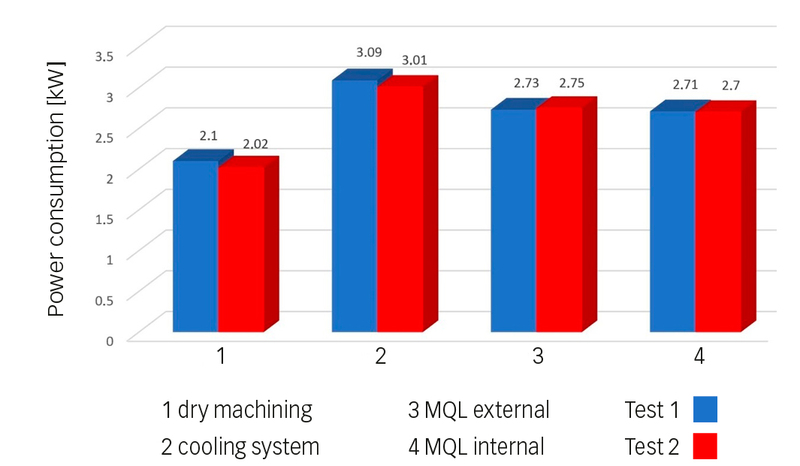 The R&D tests were designed to compare the machining performance, the effect of tool cutting force, tool wear and tool temperature under different lubrication conditions and total costs with dry machining (without lubrication), wet machining using a cooling system, and MQL internal and external lubrication. Fig. 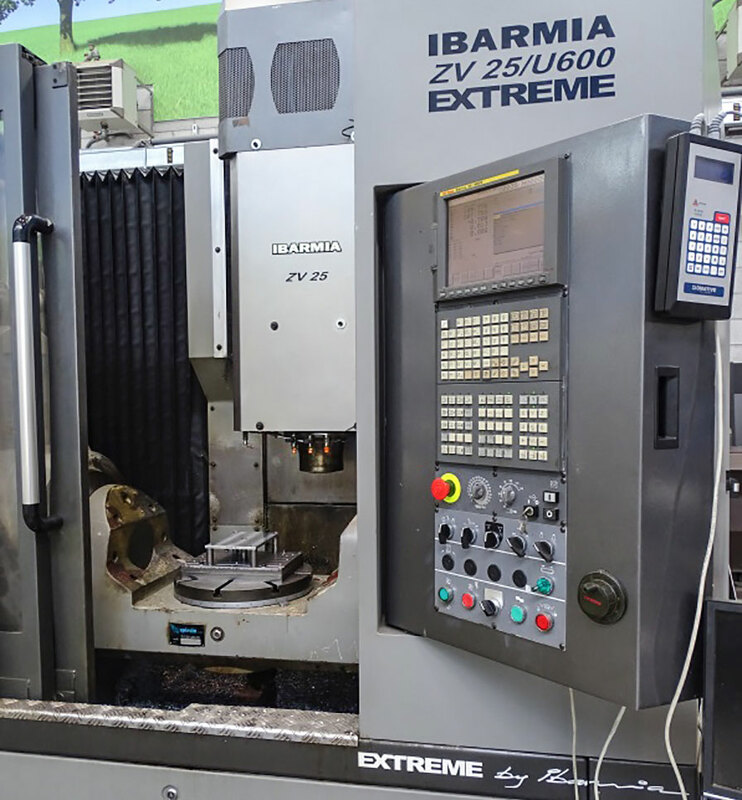 1: Machining center IBARMIA ZV 25 25/U600 EXTREME. Minimum Quantity Lubrication (MQL) is of growing importance in providing a productive, cost-effective and environmentally friendly machining process. As pressure grows on lowering production costs, tests have shown that SKF MQL Internal can cut the total cost of ownership by half compared with wet machining processes. As MQL develops in collaboration with industrial partners, the benefits will spread globally. The machine tool chosen as the basic test rig was the IBARMIA ZV 25 machining center (fig. 1). This machine was set with a wet machining cooling system, total dry machining and SKF internal and external MQL LubriLean Vario­Super. The selected test material was stainless steel duplex 1.4462, and the workpiece sizes were billets of 400 mm (15.75 in.) x 90 mm (3.54 in.). The tools were Kendu 3203.57(Z4) mills with four flutes for the tests with external lubrication or dry machining, and the same type of milling cutter, but modified, for internal channels. The tests were replicated for two tools in each of the cases, and measured values were obtained for energy consumption and tool life. Fig. 2: Power consumption during machining in the two trials. Energy consumption was measured using a FlukeView 435 power meter that connects to the power source. It records the input power of the machine, the power consumed in each phase and total power (fig. 2). A comparative analysis of tool life applying the different lubrication techniques was carried out. As an end-of-life criterion, the tool has taken the appearance of a failure in lip wear (flank wear value VB) under 0.3 mm (0.012 in). The flank wear values (VB) are measured in the flank of the tool lip by means of stereoscopic microscope at 10-pass intervals. In the dry machining tests, the tools were broken after a short time. Fig. 3: End mill burst images for machining tests with the coolant cutting fluid; upper: a) milling tool in the first trial; lower: b) milling tool in the second trial. Fig. 3 shows the state of the cutting tools in the two experimental tests performed with coolant. In the case of trial 1 (fig. 3a), the right image shows the status of tool breaking after 36 m (118 ft.) in length of mechanized shavings. In the left image the rupture of one of the flutes is thought to have been the cause of catastrophic tool breakage. In the case of trial 2 (fig. 3b) the images show that the breaking of the edges has been less dramatic. But the appearance of chipping on the tip of the tool indicates that the tool is not properly lubricated during cutting, which causes local tensions and peeling of the cutting-edge material of the milling cutter. Fig. 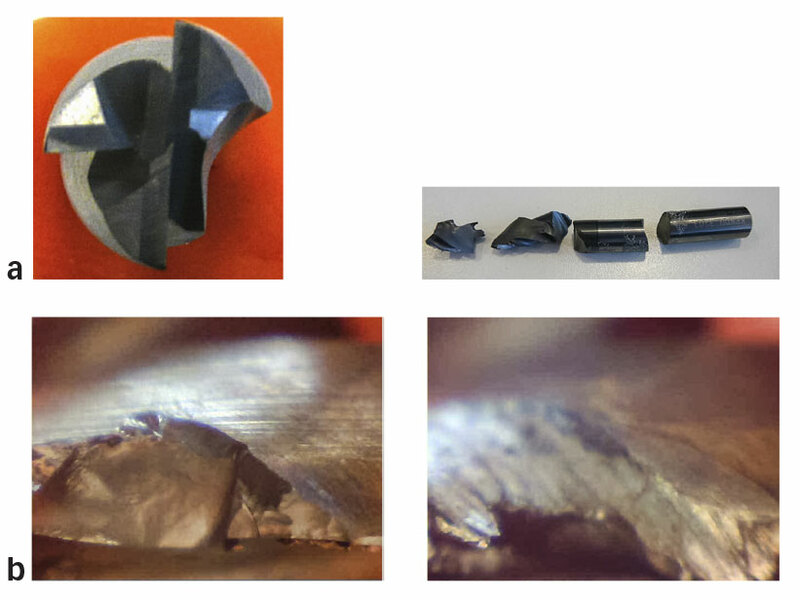 4: End mill burst images for machining tests with external MQL as lubrication method; upper: a) milling tool in the first trial; lower: b) milling tool in the second trial. Fig. 4 shows the state of the cutting tools in the two experimental tests performed with external MQL. For these tests, the edge of the tool is more progressive than in the case of machining with the cutting fluid. In the case of trial 1 (fig. 4a), the images show wear on the detachment face of the tool. In the case of trial 2 (fig. 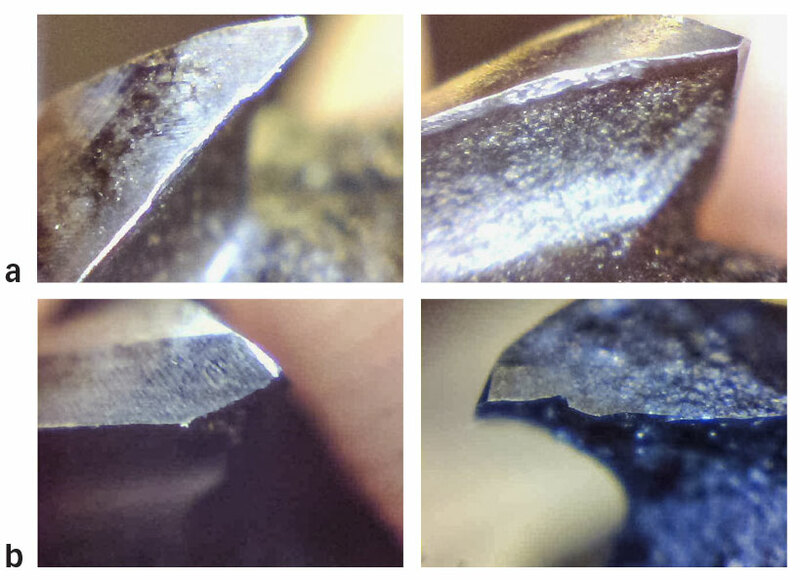 4b), the images show that the milling tool breaks at the tip, producing a fracture located at the end of the cutting edge. 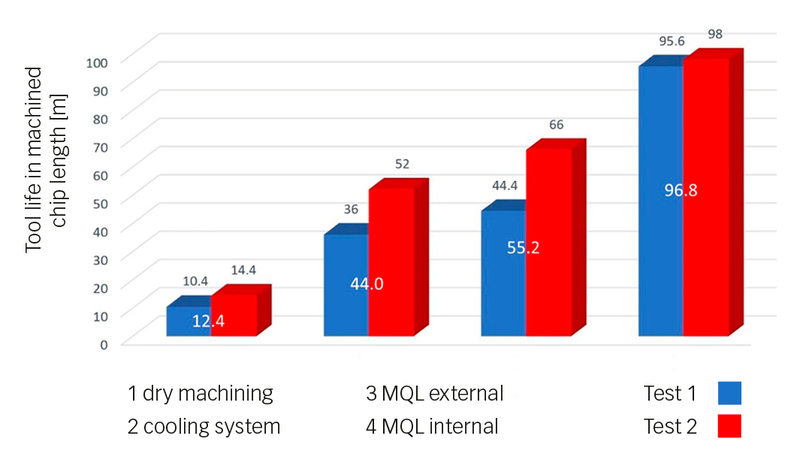 Finally, in the case of milling tests with internal MQL, the results show a more progressive wear of the cutting edge than in machining with coolant and in machining with external MQL, without cutting failure in either of the two internal MQL machining tests. Fig. 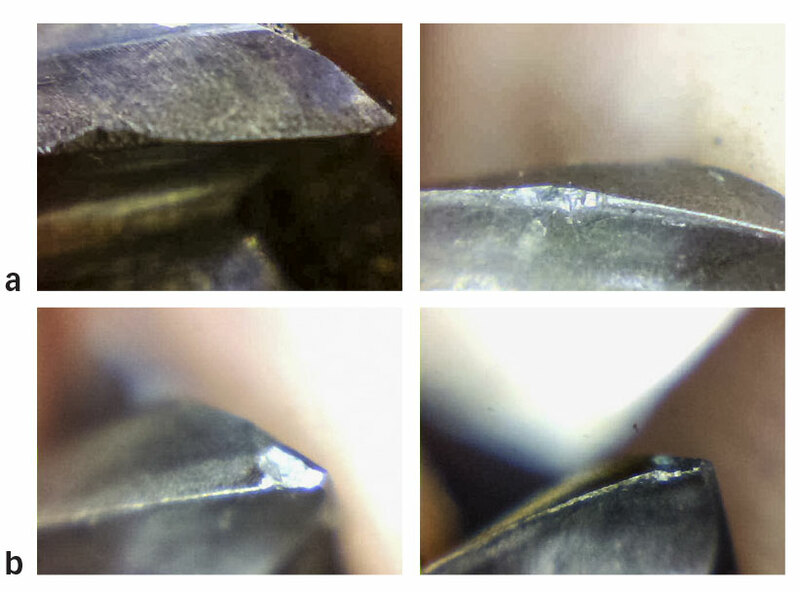 5: End mill burst images for machining tests with internal MQL as lubrication method; upper: a) milling tool in the first trial; lower: b) milling tool in the second trial. In the case of trial 1 (fig. 5a), the edge wears at the height of the passing depth. In contrast, in the case of trial 2 (fig. 5b), a micro-rupture occurs at the tip of the tool. Fig. 6 shows the chip length achieved by each of the cutting tools tested according to the lubrication technique used. In turn, the average value obtained with the different repetitions is shown for each lubrication technique. Fig. 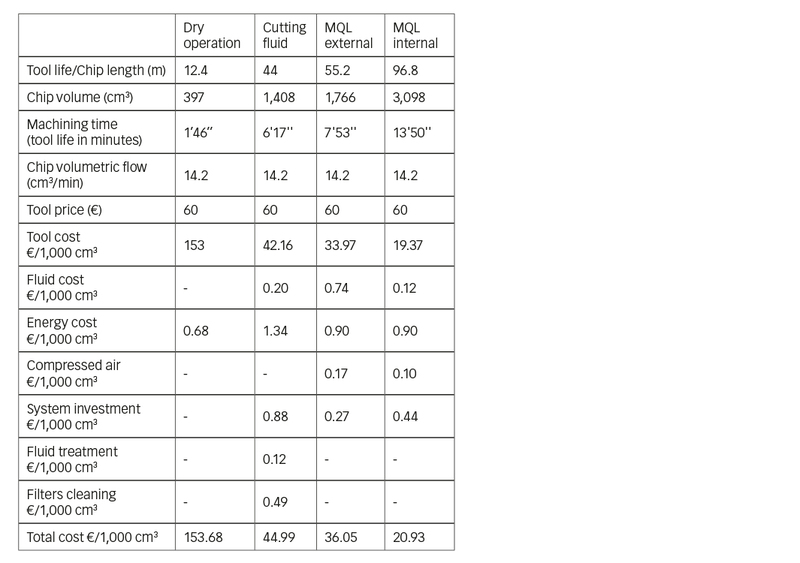 6: Tool life (machined chip length) for the different lubrication methods. 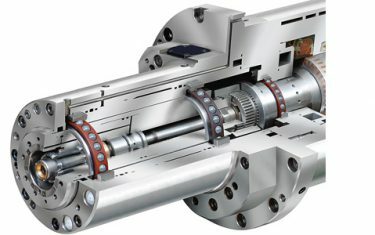 It is demonstrated that tool life is improved significantly when the internal MQL technique is used, where the length of mechanized chips is considerably higher than that obtained with the other two lubrication techniques. After calculation for the four methods, a total cost of operation (calculated for removing 1,000 cm3 [61.0 in3.] of metal) is presented in table 1. It clearly shows that the total cost of operation is reduced through the use of LubriLean MQL. With internal MQL the total cost is less than 54% of wet machining. Table 1: Total cost of operation. Deep hole drilling with small diameter tools is challenging for MQL. However, it is an important machining process. The challenge is that as the boring depth increases, the back pressure increases in the cooling ducts. Consequently, aerosol generation becomes more difficult, due to the small pressure difference between air inlet and aerosol outlet that increases the risk of tool breakage and scrap. This can lead to unnecessarily high costs, especially on workpieces made of high-quality alloys. SKF engineers set a goal of improving the aerosol supply for deep hole-drilling tasks with diameters (D) below 5 mm (0.197 in.) and depths greater than 25 x D. By integrating a bypass system into the DigitalSuper, the pressure difference between air inlet and aerosol outlet is constantly monitored. When the pressure difference is lower than the required value, the bypass will be actuated to relieve the pressure in the line so that the MQL system can generate sufficient aerosol to serve the lubrication in the tip of long and small diameter tool. 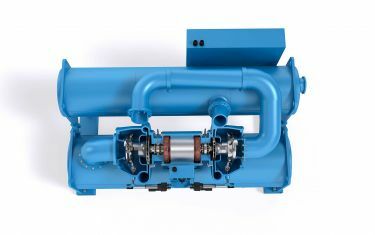 SKF has subjected its system to extensive testing to verify the results it achieves compared with the technically more complicated two-duct variant from competitors. Precision tool company Gühring provided state-of-the-art measuring instrumentation to conduct and evaluate the tests. 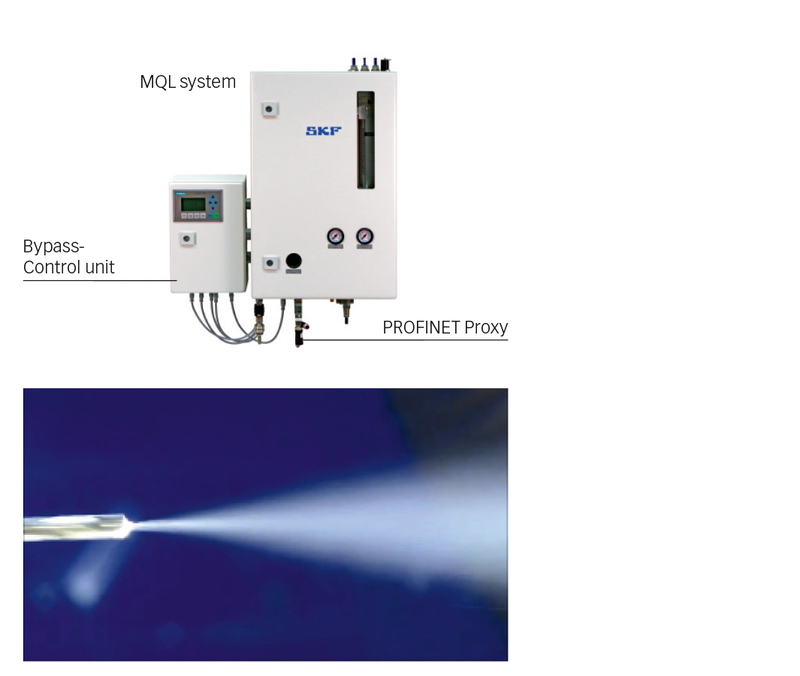 Spray and quantitative tests were performed on a special Gühring MQL test bench, and the spray characteristics were visually recorded using a camera. Tests were also carried out on AlSi7Mg, a very challenging machining material. A drill with a diameter of 4.5 mm (0.177 in.) and a length of 200 mm (7.874 in.) was used for cooling duct diameters of 0.6 mm (0.024 in.). Following the test bench analyses, a block of AlSi7Mg was machined with a cutting speed of 130 m (98.4 ft.)/min and feed of 0.2 mm (0.008 in.)/rev. The objective was to examine the drilling performance and wear on a total distance of 100 m (328 ft.). SKF’s solution required 18 ml (0.034 oz.) of lubricant per hour. The tool was still in excellent condition after a total drilling distance of 100 m.
Fig. 7: upper: DigitalSuper with bypass control; lower: the uniform aerosol output (Image: Gühring). The use of Digital Super with bypass control and 1 MPa (10 bar) inlet pressure exhibits an aerosol distribution that is more favorable to deep hole-drilling process stability than the previous variants and the competitor’s product. Video recordings provided evidence of a fine, uniform aerosol discharge at the tool, which is required for high machining quality (fig. 7). This facilitates good wetting of the machining zone and thus an improvement in tool life and workpiece quality. LubriLean has been listed as an SKF BeyondZero product since 2014. The machine tools equipped with an SKF LubriLean system are successfully employed in leading automotive and aerospace factories. Until now MQL was mainly supplied through European and American OEMs. Thanks to the success of MQL in a growing number of applications worldwide, LubriLean products can now be extended to other industries and countries. Where there are environmental problems, MQL can be applied to address these issues while offering an economical and high-quality machining process. MQL technology and product applications are developing rapidly. However the machining performance is not only dependent on MQL system itself, but also on machine tool, cutting tool, machined material, processing parameters, etc. All the factors have to be aligned and optimized together. Therefore successful applications require strong engineering support and cooperation with other technical partners. This is the starting process for the next phase in the development and growth of MQL. Minimum Quantity Lubrication, or MQL, has been developed on the principle of lubricating the tool cutting edge as accurately as possible and using as little lubricant as the machining process requires. MQL system (fig. 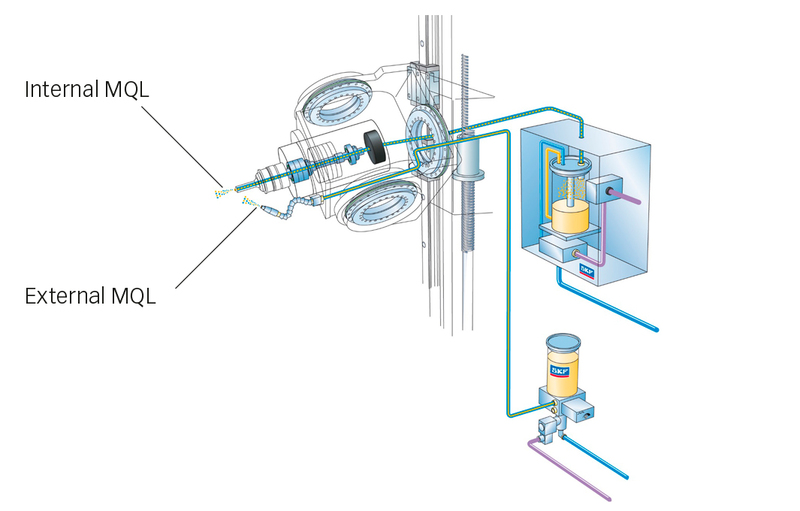 8) uses bio-oil to generate aerosol, a homogeneous droplet size in the micro area, and then delivers it to the tool cutting point to lubricate the tool, workpiece and chip through a spray nozzle pointed at the cutting point of the tool (external MQL) or through machine tool spindle and tool ducts to the tool tip (internal MQL). Such small diameter droplets prevent most of the droplets from being separated from the air by centrifugal force when the aerosol passes through the rotating spindle. Typically the amount of lubricant use is less than 50 ml (1.69 oz. )/h, depending on the cutting method, the material to be cut and the machine setting. The low quantity of lubricant products enables dry workpieces and chips. This results in considerable cost savings as it removes the need to clean either the workpiece or the chips. This technology also enables reliable lubrication of the tool blade, even with rotational speeds of more than 20,000 rpm. MQL has been applied in primary machining processes such as turning, milling, drilling and forming. With MQL technology a manufacturing cell with a complicated cooling system can be supplied with a compact lubrication solution. Fig. 9: LubriLean product range. SKF has developed a full range of MQL products and solutions ranging from internal or external lubrication for smaller or bigger tool diameters to automatic control or manual adjustable control with or without automatic monitoring of aerosol condition. Fig. 9 shows the full product range. The most advanced MQL product, the DigitalSuper series, is equipped with its own control system and is available with the advanced field bus ProfiBus or ProfiNet for machining centers and turning centers with single and double spindles. The Vario series has been designed for internal and external lubrication and can be controlled by a machine tool controller. The VarioSuper is suitable for machining centers, turning centers and special machines. The VarioPlus is hand-adjustable and suitable for turning, milling and drilling and can be retrofitted in turning and machining centers. Vario is a manual device for easy application for general and special applications (for example, multi-spindle) and retrofitting to lathes. LubriLean Basic and Smart are entry-level products for MQL for external lubrication. LubriLean Basic is particularly suitable for use on a machine where the tool is to be wetted from two sides (option for up to eight nozzles), such as milling. LubriLean Smart is a cost-effective and easy installation solution. 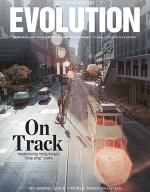 With this modular system, applications can be implemented flexibly and cost-effectively (e.g., transfer lines and centralized supply of several processing points). SKF LubriLean can serve OEM customers and end users either for new-built machine tools or for retrofitting machine tools. Instead of high-pressure coolant liquid, the SKF LubriLean devices generate aerosol with a plant-based oil through the Venturi effect without the use of a pump. This reduces energy consumption, enables higher cutting speed and longer tool life, avoids spillage in the machine tool area and provides dry workpieces without cleaning work and pollution. LubriLean and BeyondZero are registered trademarks of the SKF Group.